In a major breakthrough, the Pakistan police has detained an intelligence official and 11 others, including a suspected activist of the banned militant outfit Jaish-e-Muhammad, in connection with the recent suicide attack on President Pervez Musharraf. Hundreds of Iraqis hurled stones at British soldiers who waded into the crowd wielding batons in the south-eastern town of Amarah today, witnesses said. 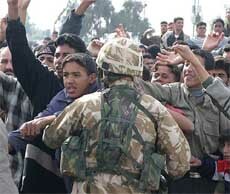 Demonstrators shout near a British soldier guarding the administration headquarters in the south-eastern city of Amarah on Sunday. British troops said they opened fire on grenade-throwing Iraqi protesters in a clash in which at least five persons were killed on Saturday. Iran was plunged into a major political crisis today after powerful conservatives moved to disqualify a large number of reformists from contesting next month’s crucial parliamentary elections, a move one MP branded a “coup d’etat”. 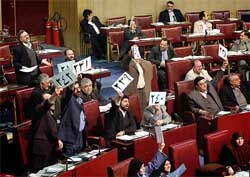 Iranian MPs hold up their numbers in protest during a Parliament session in Tehran on Sunday. Iranian reformist MPs staged a brief walk-out to protest the high number of candidates barred from February's parliamentary election by a conservative watchdog. For many weeks, Pakistan’s leading newspapers have devoted columns of space debating the bitterness, the hostility and the efforts to bring some sense into the Indo-Pak relations. Comments, though divergent on SAARC, particularly the joint statement by the two warring neighbours, speak about the general mood in that country. In a possible precursor to Oscar night next month, the final installment in the ‘’Lord of the Rings’’ trilogy won four prizes at the ninth annual Critics’ Choice Awards, an event whose picks are often echoed at the Academy Awards. ‘’The Lord of the Rings: The Return of the King,’’ the current champion at the worldwide box office, was yesterday named best picture at the ceremony, and also snagged awards for Best Director, ensemble cast and composer. 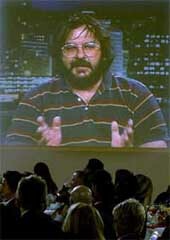 New Zealander Peter Jackson accepts the best director award for his film The Lord of the Rings: The Return of the King via satellite at the 9th annual Critics' Choice Awards at Beverly Hills ON Saturday. In a new twist to the Princess Diana episode, the Scotland Yard is to investigate evidence that a letter produced by Paul Burrell suggesting that Prince Charles wanted to kill his wife was not written at the time that the former royal butler has claimed, a media report said. Special forces of the police raided a mosque in Lahore and detained 10 persons believed to be activists of a banned militant group after the arrest of the intelligence official Muhammad Naeem, who allegedly tipped off one of the suicide bombers on December 25 about the movements of General Musharraf. Another person, who was reported to be an activist of the banned outfit Jaish-e-Muhammad, was taken into custody at Bhawalpur in Punjab, local TV channel ‘Geo’ reported today. 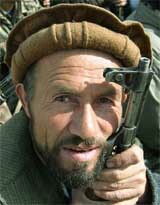 Naeem, an official of the Islamabad Special Branch who was detailed for the security of General Musharraf at the Convention Centre where he addressed a meeting on science and technology on December 25 here, allegedly tipped off the timing of the departure of the presidential convoy to the suicide bomber over his cell phone. Inspector-General of Police, Islamabad, Fiaz Ahmad Khan Toru, said the intelligence operative was in touch with the suicide bombers over his cell phone, which made him a suspect. 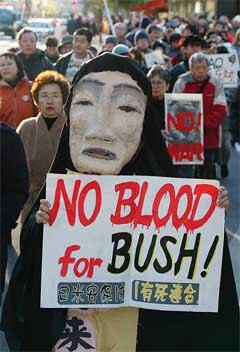 “He must be inquired and interrogated about the controversial call”, Toru was quoted as saying by ‘The News’ daily. Protesters demanding jobs tried to rush the troops guarding the city hall, but the British drove them back from the compound, which also houses the US-led occupation force and the 1st Battalion of Britain’s Light Infantry. Soldiers blocked roads, protesters continued lobbing rocks and there was a boom and flash that could have been a flash grenade. In the northern city of Mosul, four mortar shells exploded at the Patriotic Union of Kurdistan office this morning, damaging the building but causing no injuries, according to party officials who were there at the time. There was uproar in Parliament, held for the past four years by moderates loyal to President Mohammad Khatami, as it emerged that the Guardians’ Council had also barred leading figures in the reform movement, including a brother of the president. “I consider this rejection of candidates to be an illegal coup d’etat and an act of regime change by non-military means,” fumed Mohsen Mirdamadi, head of the Parliament’s foreign policy and national security commission. In a possible precursor to Oscar night next month, the final installment in the ‘’Lord of the Rings’’ trilogy won four prizes at the ninth annual Critics’ Choice Awards, an event whose picks are often echoed at the Academy Awards. ‘’The Lord of the Rings: The Return of the King,’’ the current champion at the worldwide box office, was yesterday named best picture at the ceremony, and also snagged awards for Best Director, ensemble cast and composer. The blue-collar crime saga ‘’Mystic River’’ won two prizes, Best Actor and Supporting Actor, for Sean Penn and Tim Robbins, respectively, while its director, Clint Eastwood, took home a previously announced Lifetime Achievement Award. The alleged dating of the letter, which is to be studied as part of a police review of inquest evidence into the death of Diana, has been used to support conspiracy theories that she was murdered, The Sunday Telegraph reported.